Both Marines died November 12, 2004, as result of enemy action in Al Anbar Province, Iraq. They both were assigned to 1st Battalion, 3rd Marine Regiment, 3rd Marine Division, III Marine Expeditionary Force, Marine Corps Base Hawaii. For further information contact the Marine Corps Base Hawaii Public Affairs Office at (808) 257-8840 or (808) 257-8839. 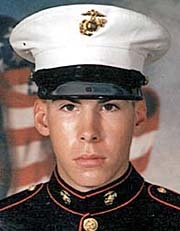 Towson, Maryland - The American flag flew at half- staff at Dulaney High School Monday and there was a tribute on the marquee in front of the school: "In memory of our fallen hero, Lance Corporal David Branning, USMC, Class of 2001." Branning, a (censored) Eysville resident who grew up in Mt. Washington, died November 12, 2004, as a result of enemy action in Al Anbar Province in Iraq, according to the Department of Defense. He was 21. Branning joined the Marine Corps in 2002 and had been assigned to the Hawaii-based 1st Battalion, 3rd Marine Regiment, 3rd Marine Division, III Marine Expeditionary Force. The 16th Marylander to die in the fighting in Iraq, he was killed in the battle for Fallujah, according to the Defense Department. Branning attended the Waldorf School and Carver Center for Arts and Technology before graduating from Dulaney High School in 2001. After enrolling at Carver in 1997, Branning specialized in visual arts as a freshman and a sophomore, according to principal Joe Freed. Enrollment in the magnet school is competitive, Freed pointed out. "David had to be gifted and talented just to get into Carver," he said. "He got very good grades in painting and drawing. He was a very talented artist." He was a very personable young man and well liked at Carver, Freed said. "His guidance counselor said he had an endearing quality about him." Branning spent his junior and senior years at Dulaney High, where he participated in a work-study program in which he worked at the upscale Oregon Grille restaurant in Hunt Valley and attended classes as well. His artistic talent didn't go for naught. "I always enjoyed getting David's notes and looking at the back of some of his tests because he would have sketches," says Kerry Williams, his 11th-grade English teacher. "Usually they were connected to what we were studying, but not always. Sometimes they were something seasonal (or) something comical or sometimes something that would make me stop and really think about whatever was the concept. "He was well liked by his peers and the faculty ... a talented, pleasant young man with a quick wit and a respect for life and all its diversities. It was a pleasure to have him in the classroom." Branning's evaluations by the Oregon Grille were for the most part outstanding, according to school records. Jason Openhym, who is the sous chef at the restaurant and a friend, said he watched Branning mature while he worked there. "David started out washing dishes when he was 16, and by the time he left he was a key member of the line staff," Openhym said. "He could pick up anything very quickly - some people do something 30 times, and they still don't get it." Branning got along with everybody, Openhym said. "If there was an uncomfortable situation, he would lighten it up. He knew when and when not to be a funny guy." Branning was "up for anything," according to Openhym. "I think David wanted to get beyond (censored) Eysville, to travel," he said. "He talked about heading for Europe with another cook and talked about learning French. But he realized they didn't have the financial means. He figured the military would be a way to do that." Branning's mother died more than seven years ago. He is survived by his stepmother, Tia Steele of Baltimore; his father, Daniel C. Brannning of Albuquerque, New Mexico, and his sister, Annie Branning of Yellow Springs, Ohio. "This has been very, very hard on his family," said family friend Rachel Moulten of Yellow Springs. "David was a very funny, beautiful person - very sharp and quick - and he was a huge part of each of their lives. "It has been a tremendous loss, but the outpouring of love and concern they have received has been a reminder that there is still good out there." Branning's body was to be sent to Yellow Springs. A memorial service will be held in the Baltimore area, but details have not yet been set. Tia Steele recalled a telephone conversation with her stepson, Lance Corporal David M. Branning, last week. After they'd said their goodbyes, Steele said, "It was like he didn't want to quit talking, but he couldn't say what was happening. He's a Marine, so he couldn't say he was scared ... but those guys came out of Hawaii. They didn't have any combat experience. None. I thought he was going to come out of it. And he didn't." Branning, 21, of Baltimore, and Medina, 20, of Woodbridge, Virginia., died Friday in the fight for the terrorist stronghold of Fallujah, Iraq, the Pentagon said. Both Marines were single and are survived by their parents. Both were assigned to the 1st Battalion, 3rd Marine Regiment, 3rd Marine Division, III Marine Expeditionary Force, based at Marine Corps Base Hawaii in Kaneohe. They were the 10th and 11th members of the unit killed in Iraq since it arrived there last month. Since the March 2003 start of the war in Iraq, 37 servicemen and women with Hawaii ties have been killed in Iraq, Kuwait and Afghanistan. It was Brian Medina's conviction that terrorist camps existed in Iraq prior to the war, Gregory Medina said. "He said he was sitting in a former terrorist camp writing me a letter," said Medina, a retired Navy Seabee. Brian Medina's last phone call home was November 3, his father said. "He said they belong there. There's nobody there who wants to go home," Medina said. "He called home as much as he could." Brian Medina enlisted in August 2002 and was assigned to Kaneohe in January. "We're very sad," Megan Branning, a cousin of David Branning's, said Sunday. "The war in Iraq has hit close to home in our family." "He was wonderful," said Steele. "I keep telling people, I hope everyone has a chance to love and be loved as I was by David. He was an old soul. He had a curiosity. That's one of the reasons he decided to join the Marines. He wanted to see things, to find out about the world beyond Baltimore." Steele said Branning grew up in Baltimore, enlisting in the Marines in 2002, a year after graduating from Dulaney High School in Baltimore County. He came to Hawaii in November 2002 where he picked up hobbies including surfing, sky diving and rock climbing. Back home, his family was optimistic that he might avoid combat, Steele said. Steele said she talked to Branning a week ago. "He called and said, 'You're going to hear on the news that eight Marines were killed in my company, but I'm OK.'"
A memorial service for Branning in the Baltimore area was being planned for Dec. 4. An all-out assault on Fallujah began November 8 as U.S.-led forces sought to hunt down terrorists while the country prepares for crucial elections on January 31, 2005. In Iraq on Sunday, the U.S. military's assault of Fallujah had gone more quickly than expected, with the entire city occupied after six days of fighting, said Marine Maj. Gen. Richard Natonski, who planned the operation. The military said Sunday at least 38 Americans and six Iraqi soldiers had been killed during the Fallujah assault. Earlier, U.S. commanders said more than 1,200 terrorists had been killed since the siege began. Five days later, two more of Aguirre's buddies — Lance Cpl. 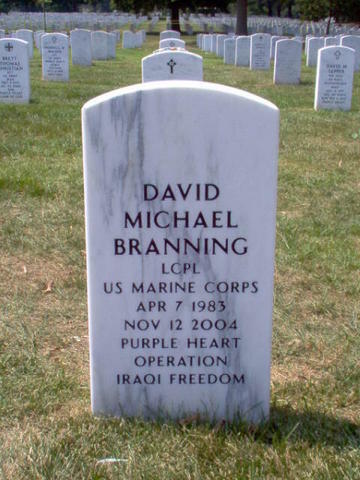 David M. Branning, 21, of Baltimore; and Lance Cpl. Brian A. Medina, 20, of Woodbridge, Va. — would die. Aguirre and Branning were roommates on a deployment to Okinawa 14 November 04. "Hey, Dad, you probably already know: We lost two guys in the platoon, and they were in my squad. Branning and Medina died from machine gun fire and just lost too much blood. It happened on the 12th. We were clearing buildings, and we found caches of (weapons). Also heroin and other drugs. I guess they were all hopped up because you had to shoot at least four or five rounds to drop them." Marine Lance Corporal Jerry Aguirre was badly grazed by a bullet in Fallujah. Two members of his squad were killed in the same battle. "It happened so fast: (Corporal Alexis) Ayala's team went first; Branning and Medina kicked the gate open and maybe 3 to 5 feet inside, machine gun fire. Everybody gets cover, and we suppress the building; we are talking to Branning and Medina to hang in there. "The gun position was well concealed and had great fields of fire. We fired 40mm (high explosive rounds) and had a (Light Armored Vehicle) come up and fire its guns. Corporal (Andrew) Etheridge took a shot in the right leg; Doc (Robert C.) Trottman did a fabulous job on him; then we got Branning out of there. "DC (Corporal Michael DanielCollins) and Ayala grabbed him. There was a trail of blood; he died seconds later. He took a shot in the neck, and it exited out of his head. Then I got hit on the left side of my back as I was laying suppressive fire with the rest of the guys. "It was a bad graze; I got lucky. Doc threw a dressing on and they put Medina on the (Light Armored Vehicle) with the rest of us, but he died five minutes later en route to the battalion aid station. "Both Branning and Medina were awesome guys, and they brought a lot to the squad and platoon. They were well-liked and good Marines. It was great seeing the rest of the platoon back, the hugs and handshakes. It is a brotherhood. "We're taking the deaths well, but we understand we have a job to do. We'll have our first beer for those guys and cry our hearts out."